Plant Health maps, Prescription files, Plant Counts and more from RGB and multispectral sensors. We offer a complete set of analytic tools for your drone imagery. Solvi turns simple and easy-to-use consumer oriented drones like DJI Phantom into day-to-day scouting tools. With our data processing and analysis tools farmers make more effective use of inputs to minimize costs and increase yields.
" I like how I can with just few clicks get better understanding about my crops, so I can focus more on farming and less on technology"
" My customer was impressed how smooth and easy it was to create variable rate application files that we used in his winter wheat field"
Solvi enables agronomists provide recommendations based on accurate and up to date data. 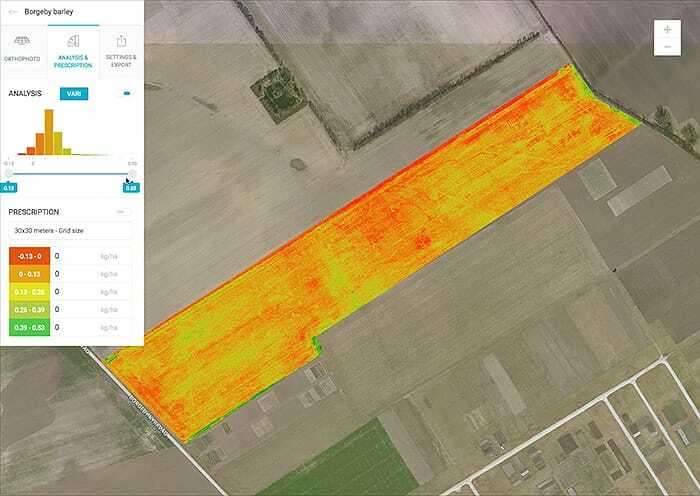 With our easy to understand crop health visualisations, sharing and PDF-report tools, we help agronomists and drone service providers better communicate dicisions to their customers. Collect imagery with any drone and camera. We process data from most sensors available on the market, both RGB and multispectral, without limiting number of uploads, images or resolution. Use our tools to interpret and visualise collected data. Spot variations in the field with basic vegitation indices, like NDVI or VARI, or define your own indices for more advanced analysis. Export prescription files compatible with most farming machinery and software. Create PDF-reports and share your data for more effective communication. Start making decisions based on precise data.